It can be argued that speech and language therapy is the most important part of intervention services for children with Down syndrome if we wish to promote their cognitive (mental) and social development. In our view, speech and language development are absolutely central to the cognitive development of all children. First, words equal knowledge and the faster a child learns vocabulary, the faster he or she is acquiring knowledge about the world. Therefore vocabulary development is very important - the number of words that a child knows when he or she enters school at five years will have a very significant influence on progress. Secondly, language supports thinking and reasoning. The human brain has evolved a remarkable ability to learn spoken language with amazing ease and then to use that spoken language for mental activities. Thinking, reasoning and remembering, for example, are usually carried out in mind as 'silent speech'. It follows, therefore, that any child with significant delay in acquiring language will be delayed in the ability to use these cognitive processes. Although delayed, almost all children with Down syndrome will use spoken language as their main means of communication. The use of signs in early years will help them to progress but for most children signs are used as a bridge to talking, not to teach a sign language. The more we can do to help children with Down syndrome to learn to talk, the faster they will progress in all areas of cognitive and social development. While the speech and language skills of children with Down syndrome are delayed relative to non-verbal mental abilities, different aspects of speech, language and communication skills are not equally delayed. Individual differences are seen within the typical profile, with some children having more speech difficulties than others, relative to language comprehension and some children having larger differences between comprehension and production than others, for example. Therefore, each child with Down syndrome should receive an individualised therapy programme but the principles for effective practice upon which this should be based is the same for all children with Down syndrome. Research is beginning to provide some useful information on the underlying causes of the speech and language profile associated with Down syndrome. The development of early grammar has been shown to be linked to total productive vocabulary for typically developing children as well as for children with Down syndrome. Therefore, the very slow rate of productive vocabulary development that is typical for children with Down syndrome may mean that the development of grammar is delayed beyond the optimal period for grammatical acquisition (1-6 years) - for a full discussion of this issue see . All experts identify the need to have separate targets for the four components of speech and language skill - communication, vocabulary, grammar and speech work, for each child. There is agreement on the use of sign systems to promote spoken language with benefits for both comprehension and production. There is agreement on the importance of using reading activities to teach spoken language for those of all ages. In particular, the benefits of using early reading in preschool years as an explicit language teaching activity are recognised. All experts identify that language is learned all day, every day, as children are involved in communication with their families and friends and therefore the focus of effective therapy must be to share skills with parents because they will be their child's best therapist. Specialist training for work with children with Down syndrome will be helpful and up-to-date knowledge of the research literature is essential. The needs of children with Down syndrome tend to be different from the needs of other children with learning difficulties. Their hearing, phonological loop impairment and speech-motor difficulties make them different and therapists need to be skilled in auditory discrimination, oral-motor function and speech work as well as language work. to understand the importance of auditory discrimination for speech sounds, phonics activities, phonological awareness training and speech work in order to improve working memory function as well as speech. in the second to fourth years various models can be effective, including group sessions to ensure families know about speech and language development and at which individual targets can be set for them and their infant. Group activities can be started with babies from about 18 months and they usually enjoy learning in this way, with the opportunity to copy and learn from other children. Group activities can also develop attention and the ability to take turns. In the groups, activities can be modelled by the therapist to increase parent's confidence at carrying them on at home. Parents frequently report that children are often more willing to show what they can do in groups than when asked to do the same things at home! Groups may reduce the individual pressure on children, though sometimes children do not enjoy groups and can become resistant to group activities. Groups are a cost effective way to offer services and also provide general parent support. Parents often have effective tips to share with each other and the progress of older children is motivating for parents of younger ones. Encourage a good communication environment at home and ensure that parents understand the speech and language needs of their child, and how speech and language develops. Provide support for feeding and activities for oral-motor development. Encourage all communication skills, eye-contact, turn-taking, pointing and joint-referencing by the end of the first year. Target auditory discrimination for speech sounds to improve auditory discrimination in the phonological loop. Target auditory discrimination for speech sounds in order to support the development of babble (typical babies tune their babble to the language they are hearing by 12 months - in other words they are setting up the speech-motor skills for talking). Encourage the use of gesture and sign primarily to aid comprehension. Encourage a good communication environment at home and ensure parents understand the speech and language needs of their child, and how speech and language develops. Continue with targeted work in support of hearing and producing speech sounds - single sounds and reduplicated babble (for speech and for auditory memory development). [4,5,12,24] Keep a record of speech sound progress. Teach comprehension and production of early vocabulary with games using objects, pictures and actions to supplement the daily language exposure of the child. This approach is currently recommended by the Hanen programme for children with Down syndrome. [10,11] They recommend targeted teaching and practice of words, then two and three word constructions, as they do not believe that the quality language immersion approach is sufficient for children with Down syndrome. They advise that the words chosen for imitation are chosen with initial consonant sounds that the child can already make, highlighting the need to address speech sound production skills in advance of vocabulary and language progress. Keep a record of words understood and words signed or spoken. Teach two and three words constructions through play and encourage imitation by child. Address communication skills if necessary (3-5% have autistic spectrum difficulties). Records of vocabulary comprehension and production should be kept  and therapists should be aware of the important link between productive vocabulary size and the development of grammar in production, which has been demonstrated for typically developing children and children with Down syndrome. [see 24] This means that at least some of the grammar delay seen in children with Down syndrome is the result of delay in learning vocabulary. Further there is evidence of a critical period for learning grammar (to about 6 years) when the brain is maximally receptive and there is evidence that mastering grammar significantly effects phonological development in children. All these findings have significant implications for our understanding of the speech and language profile usually seen in children with Down syndrome and significant implications for early and continued therapy. 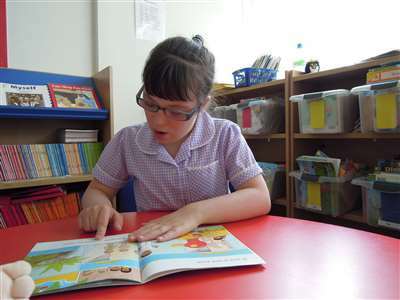 Ideally all children with Down syndrome should receive speech and language therapy in school but access to this service will vary considerably from place to place. Progress at five years will vary widely between children, with some having quite clear production of 3 or 4 word sentences but with grammatical markers missing, the majority at a 2 or 3 word stage in production, much of this difficult to understand, and some with very few words or signs. Most children will have significantly better comprehension than production. Reading activities will be an important support for speech and language development throughout the school years. Detailed information on the range of progress of children can be found in the books in the DSii series on Development and Education - see Resources. encourage a good communication environment at home and at school, and ensure parents, teachers and learning support assistants understand the speech and language needs of their child, and how speech and language develops. these activities should be modelled with the child by the speech and language therapist, so that parents and assistants can confidently enable the child to practice daily. Therapy sessions will not change speech and language development unless they lead to an increase in daily teaching activities and appropriate styles of communication at home and at school. some children with Down syndrome of primary school age may need weekly individual or group sessions of speech and language therapy with a therapist who has the specialist knowledge and the skills to address their profile of difficulties, particularly for speech and intelligibility work. Speech and language therapy should continue for all teenagers with the same list of key objectives and targets as for the primary age group, but adapted to focus on age appropriate language needs and activities. Some teenagers with Down syndrome will be making good progress and talking in reasonable sentences, others will still have fairly limited spoken language. The range of individual differences is very wide. Many secondary school pupils with Down syndrome will have small productive vocabularies (800 words or even less) and limited productive grammar. Reading activities will still be an important way to help all teenagers. Most will still have phonological and intelligibility difficulties that should be targeted, and the social use of language, particularly the ability to initiate and maintain conversations, may need addressing. these activities should be modelled with the teenager by the speech and language therapist, so that parents and assistants can confidently enable the young person to practice daily. Therapy sessions will not change speech and language development unless they lead to an increase in daily teaching activities and appropriate styles of communication at home and at school. some teenagers with Down syndrome of secondary school age may need weekly individual or group sessions of speech and language therapy with a therapist who has the specialist knowledge and the skills to address their profile of difficulties, particularly for speech and intelligibility work. A recent study in the UK and work in the USA has indicated that speech and language skills can be improved with therapy during the adult years. [2,22] However, speech and language therapy services for adults are even scarcer than those for children. This is an area for further work and an article on work with adults will be published in next year's issue of this journal written by a practitioner in this field. Communication skills in children with Down syndrome - A guide for parents. By Libby Kumin (1994). Bethesda: Woodbine House, MD, USA. ISBN: 0-933149-53-0. 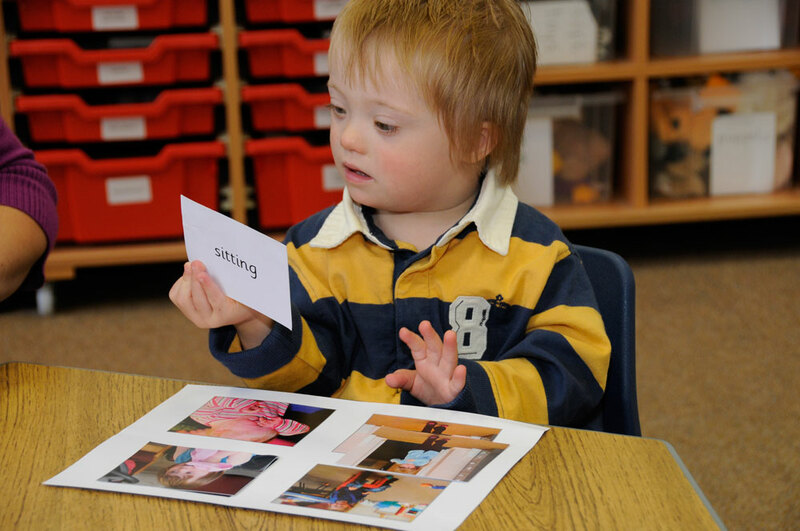 Classroom language skills for children with Down syndrome - A guide for parents and teachers. By Libby Kumin (2001). Bethesda: Woodbine House, MD, USA. ISBN: 0-890627-11-9. Four early language games are available from Down Syndrome Education International, sold either separately or as a set, saving 15%. DSE picture lotto, illustrating first words with full colour photographs. DSE picture dominoes, for picture matching and teaching vocabulary. DSE consonant sound cards, with picture prompts for 20 English consonant sounds to encourage toddlers to listen to and to imitate the sounds. DSE language cards, with colour photographs illustrating a selected set of first words. The authors would like to thank Leela Baksi and Margaret Wright, Speech and Language Therapists, for feedback on an earlier draft of these guidelines. However, the opinions expressed, and any errors or omissions, are the responsibility of the authors. Chapman, R.S. (1997) Language development in children and adolescents with Down syndrome. Mental Retardation and Developmental Disabilities Research Reviews, 3, 307-312. Miller, J.F., Leddy, M. & Leavitt, L.A. (Eds.) (1999) Improving the Communication of People with Down Syndrome. Baltimore: Paul H Brookes Publishing. Stoel-Gammon, C (in press) Speech acquisition and approaches to intervention. In J.A. Rondal & S.J.Buckley (Eds) Speech and Language Intervention in Down Syndrome. London: Colin Whurr. Stoel-Gammon, C. (1998). Sounds and words in early language acquisition: The relationship between lexical and phonological development. In R. Paul (Ed.) Exploring the Speech-language Connection (pp.25-52). Baltimore: Paul H. Brookes. Johansson, I. (1994). Language Development in Children with Special Needs - Performative Communication (2nd Ed.). London: Jessica Kingsley. Weitzman, E. & Clements-Baartman, J. (1998) Vocabulary intervention for children with Down syndrome: Parent training using focused stimulation. Infant Toddler Intervention, 8 (2), 109-125. Clements-Baartman, J. & Girolametto, L. (1995) Facilitating the acquisition of two-word semantic relations by preschoolers with Down syndrome: Efficacy of interactive versus didactic therapy. Canadian Journal of Speech-Language Pathology, 19, 103-111. Hart, B (1996) The initial growth of expressive vocabulary among children with Down syndrome. Journal of Early Intervention, 20, 211-221. Cholmain, C.N. (1994) Working on phonology with young children with Down syndrome - a pilot study. Journal of Clinical Speech and Language Studies, 1,14-35. Dodd, B., McCormack, P. & Woodyatt, G. (1994) Evaluation of an intervention program: relation between children's phonology and parent's communicative behaviour. American Journal on Mental Retardation. 98 (5) 632-645. Laws, G., Byrne, A. & Buckley, S.J. (2000). Language and Memory Development in children with Down syndrome at mainstream and special schools: A comparison. Educational Psychology, 20(4), 447-457. Byrne, A. (1997) Teaching reading to children with Down syndrome. Unpublished PhD Thesis. University of Portsmouth. Buckley, S. (in press). Literacy and language. In J.A. Rondal & S.J. Buckley (Eds) Speech and Language Intervention in Down syndrome. London: Colin Whurr. Jenkins, C. (2001). Adults with Down syndrome: an investigation of the effects of reading on language skills. Unpublished PhD Thesis. University of Portsmouth. See Record Keeping checklists] in Resources list.